Only about 20k LY left to the Hub - this has gone far quicker than expected! I use The Porcelain Grasshopper for long trips like this, an A-class Explorer that gets about 1090 LY per warp * 20 warps on a full tank. Along the way, it&apos;s the quietest places that compel me to linger a moment. 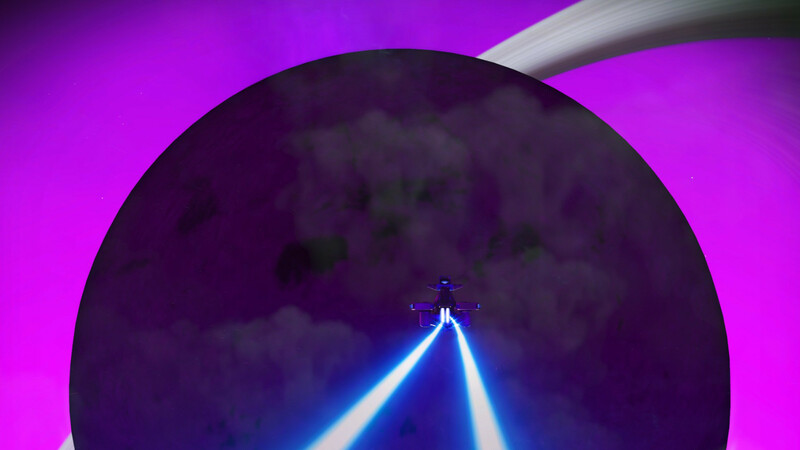 A brilliant purple system, uncharted and undiscovered til today, with a single, massive, dreary planet. Just me and a few scissor-tailed birds that remind me of Texas. And before I know it, I&apos;m there. 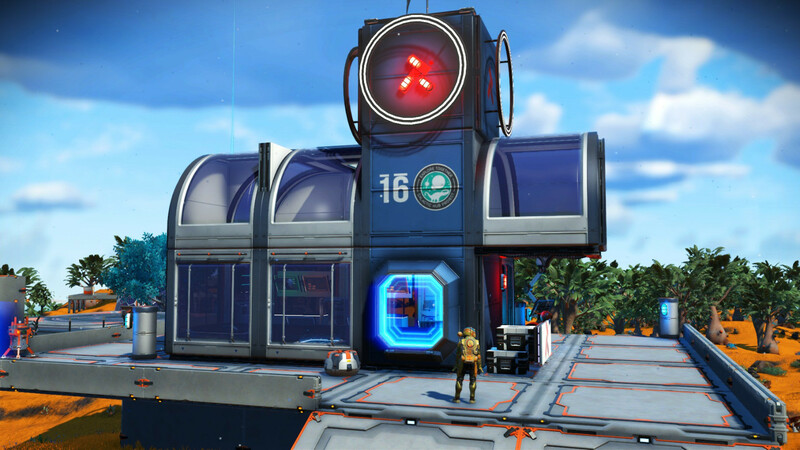 Gain&apos;s Folly on TopOfTheTree3, the "portal system" people can visit (but not settle) via portal, as I had a few weeks ago before deciding on this adventure. I wasn&apos;t sure if civilization would fade in gradually the way it does in a real-life road trip, with gas stations and suburbs slowly rising up into cityscape. But this is a universe of instantaneous warp travel, and grand structures appearing overnight. 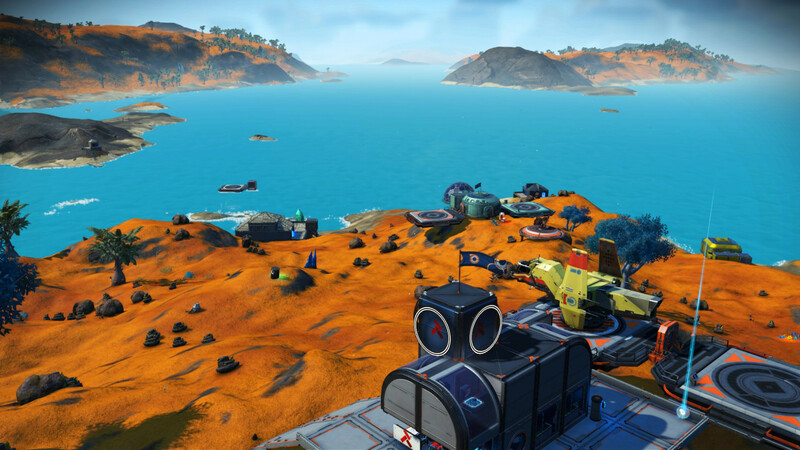 So many places I can explore from here, now that I have a proper foothold in the Hub. 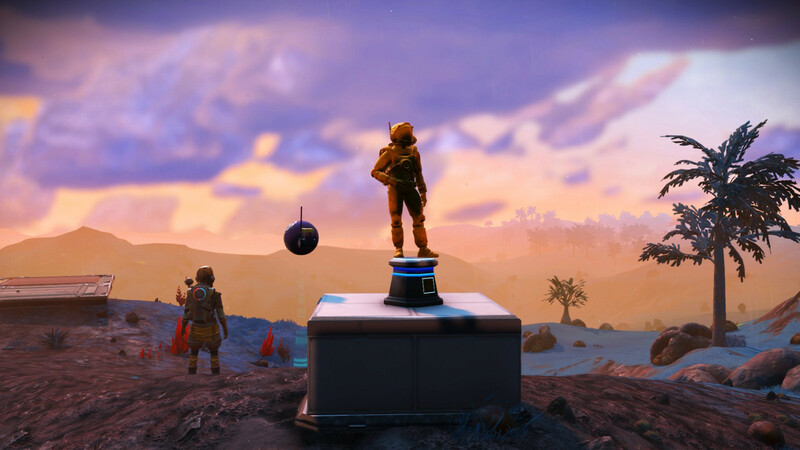 I visited the capital world, New Lennon, but a server error prevented me from seeing anyone&apos;s bases. 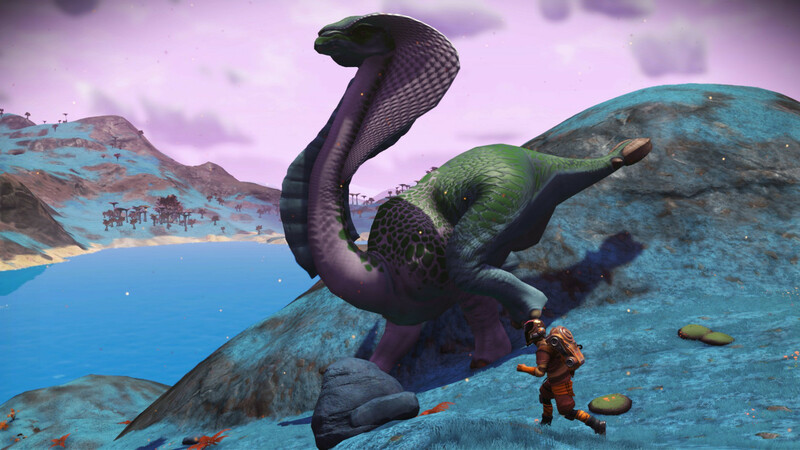 I at least got to admire the scenery and meet a famous local creature, the 6.5m tall Jade Hood Diplo. 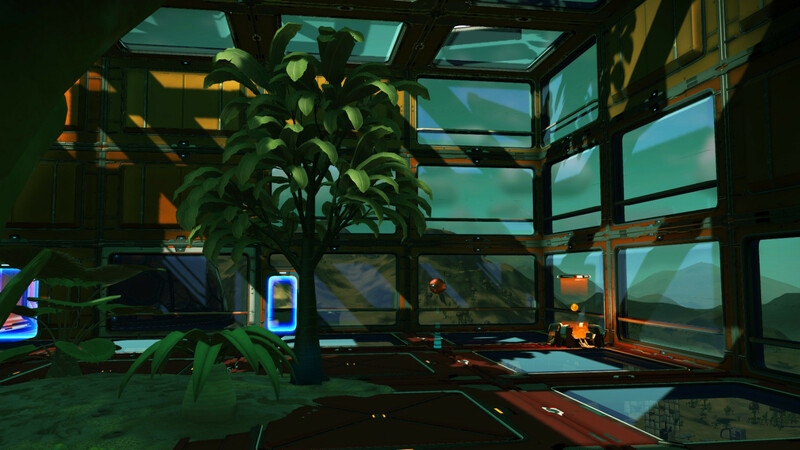 There are plenty of bases built for obvious utility, like this Gamma Weed farm which glows pleasantly at night. In a nice stroke of Fully Automated Luxury Communism game design, harvesting crops is entirely client-side (separate copies of a given plant in each player&apos;s game) so building a farm is like opening a giant free buffet to all visitors. It&apos;s not uncommon to find notes of gratitude left by visitors. It is nice to exist within a community with such values. But I also appreciate how little sense other bases make, how little they care to explain themselves. 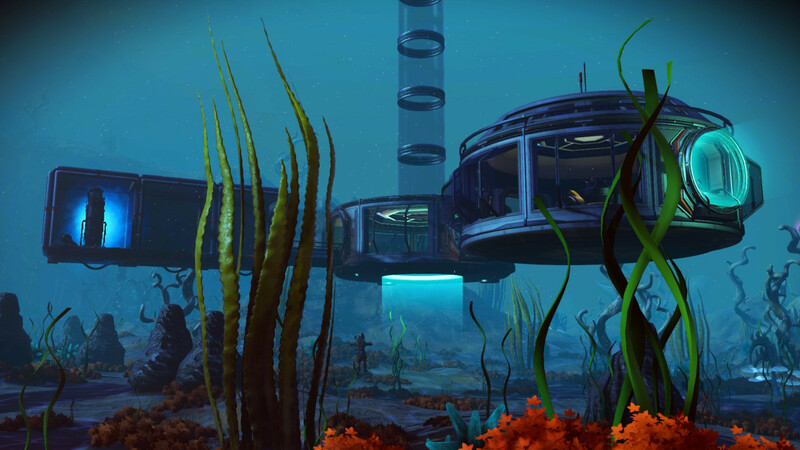 This large, intricate underwater base on a torrid ocean planet meanders like a maze, without clear purpose, downward to the sea floor. 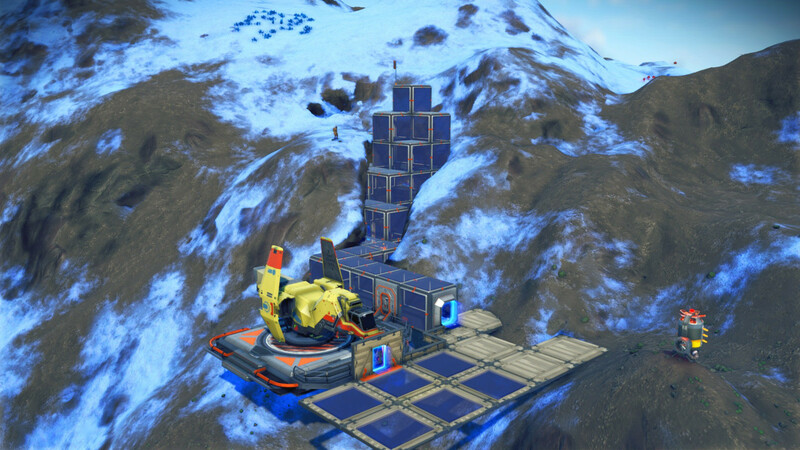 Spent some time today spiffing up the base I&apos;d claimed on Gain&apos;s Folly. 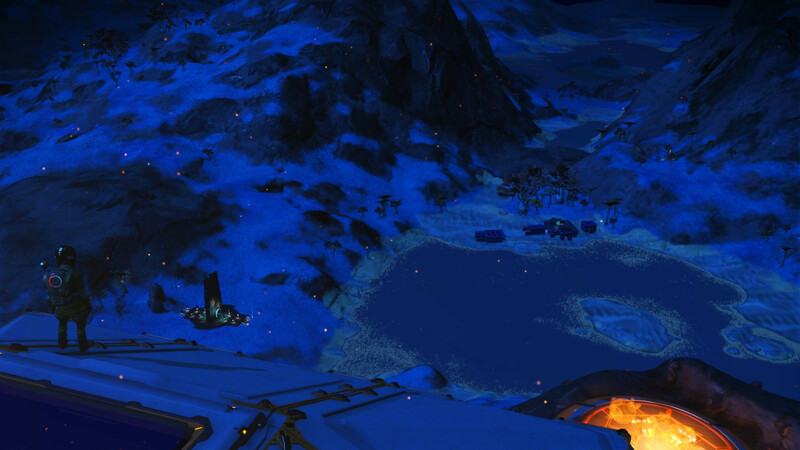 If you have all the portal glyphs you can visit it at https://galacticatlas.nomanssky.com/me/1021f9556c30 ; as you crest the hill just past the portal see the last image for where I am on the skyline. 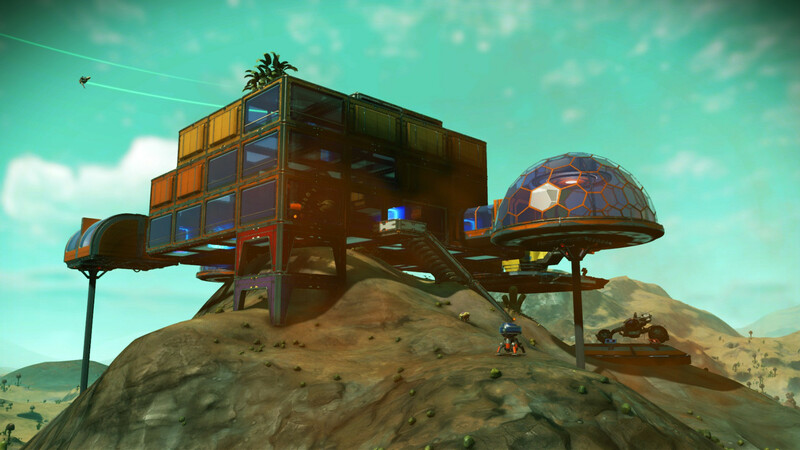 Enjoy the panoramic view, sit a spell on the rooftop couch, help yourself to the motorcycle and all the Frostwort (glass) in the farm domes. It&apos;s interesting how building even a few tall things creates a skyline that others may in turn seek to have a nice hilltop view of. 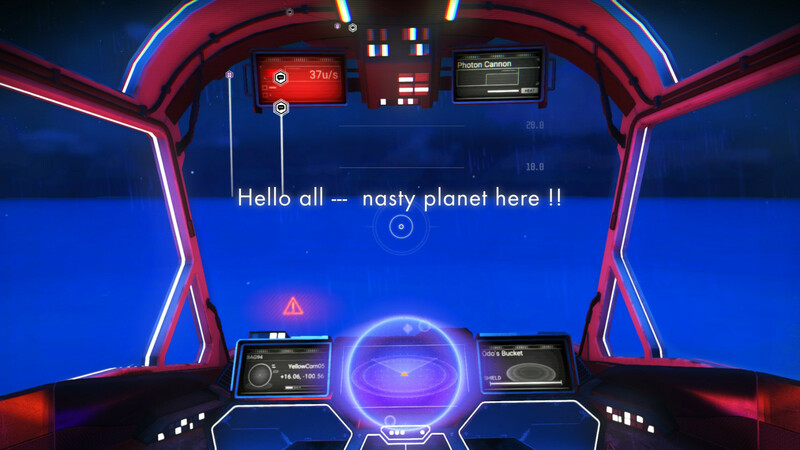 The dynamics of land grabs in digital spaces have likely been well-studied in older "virtual worlds" but I wonder how different they are here in NMS where there&apos;s effectively infinite space to build. We still want to be near others - to share, to show off, to sign the guestbook. 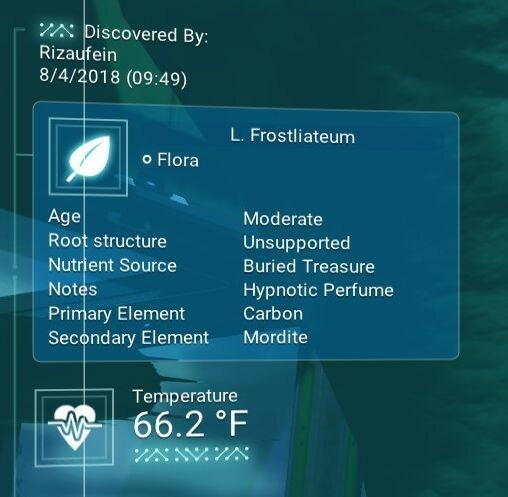 At the heart of the New Arcadia base is a mighty specimen of L. Frostliateum, one of the largest plants native to Gain&apos;s Folly. 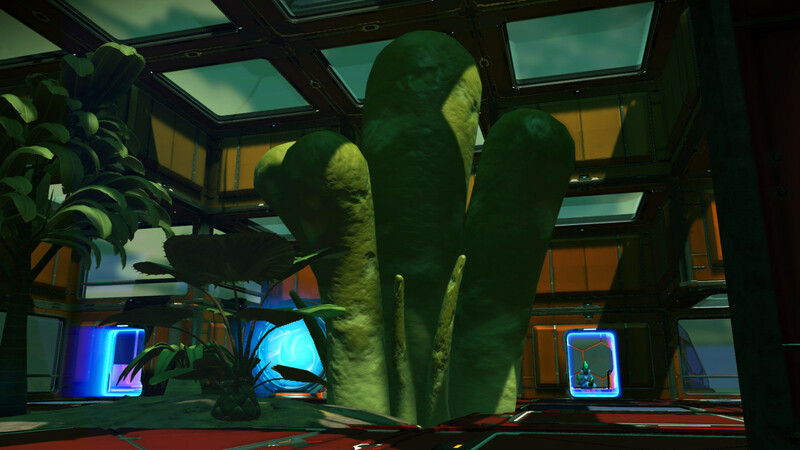 As soon as I selected the base&apos;s site I decided I was going to build around this plant rather than chop it down. 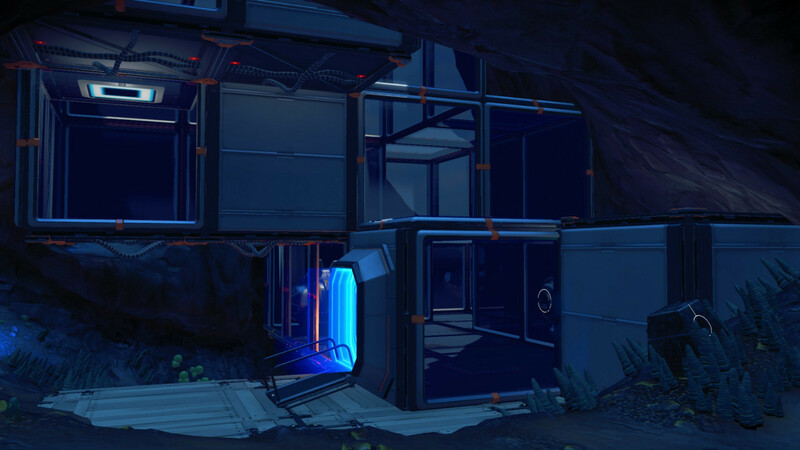 In general, I&apos;m very interested building bases that harmonize with the native landscape as much as possible within the constraints of NMS&apos;s building mode. 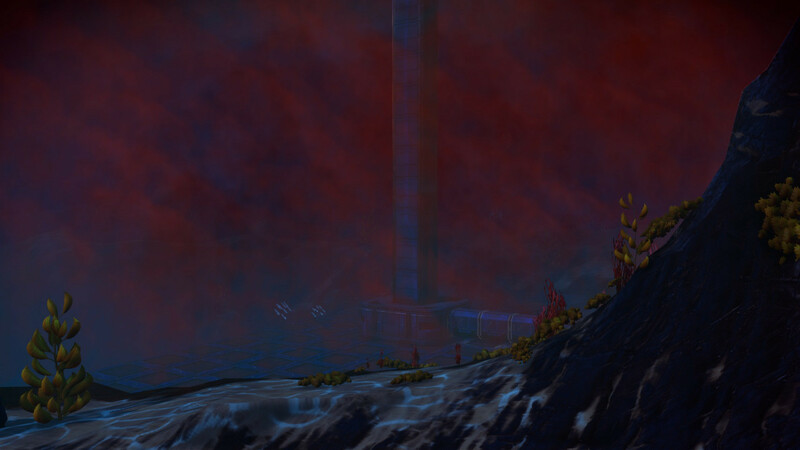 Had a cool unscripted moment in my first 10 minutes of checking out the Abyss update last night. 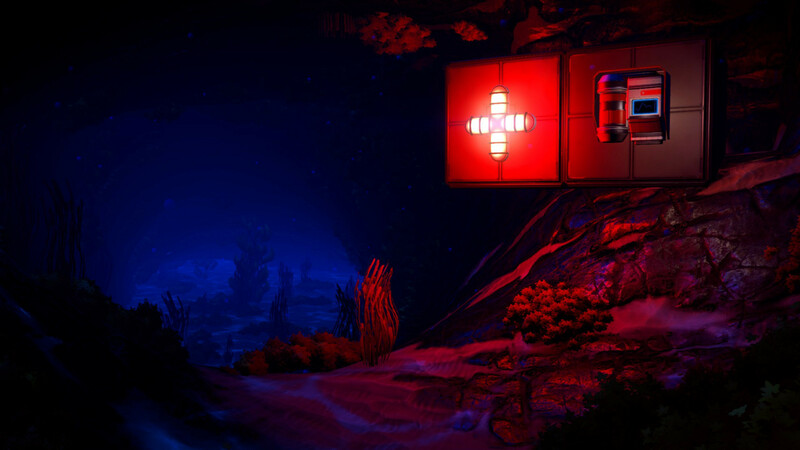 I build the new mini-sub and head down to the first abandoned building the quest points me to, head inside and find the spooky log, but when I come back out I see... fish, stunned or dead, floating slowly down to the ocean floor. I look up ~30m and see three massive shark-eels in a feeding frenzy. Hopped in my sub and sped away, staying low to avoid their notice. 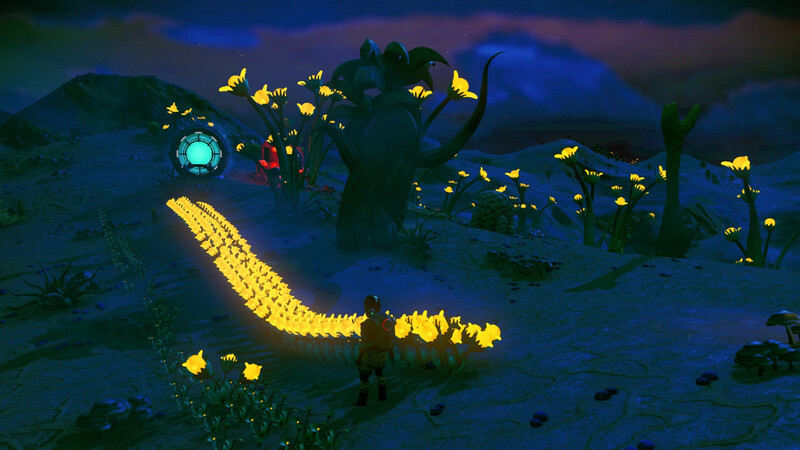 Game designer tangent: the point of having emergent things in your game is less to create a sense of constant surprise, treating systems as a generator of the unexpected that must by necessity wind down eventually, and more to slowly build a world that is surprising on first contact but consistent and learnable over time. With the above story, I now know how to better sense ocean predators. 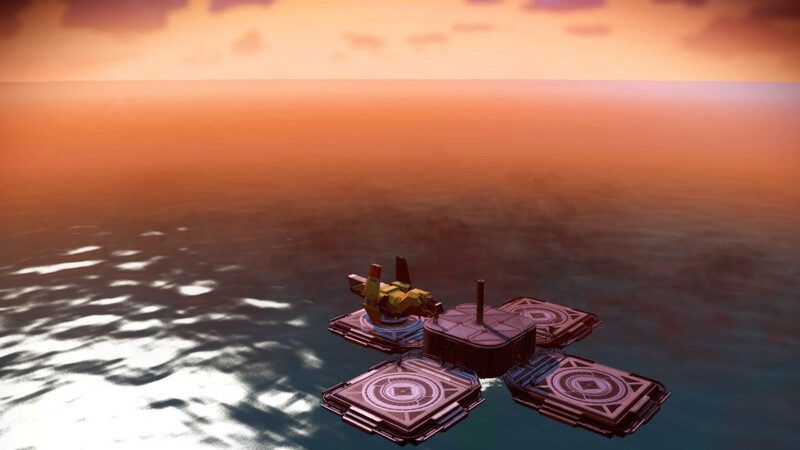 The recent undersea adventures happened mostly on this rather pleasant (on the surface) world, one I found on the far side of a randomly chosen black hole last month. 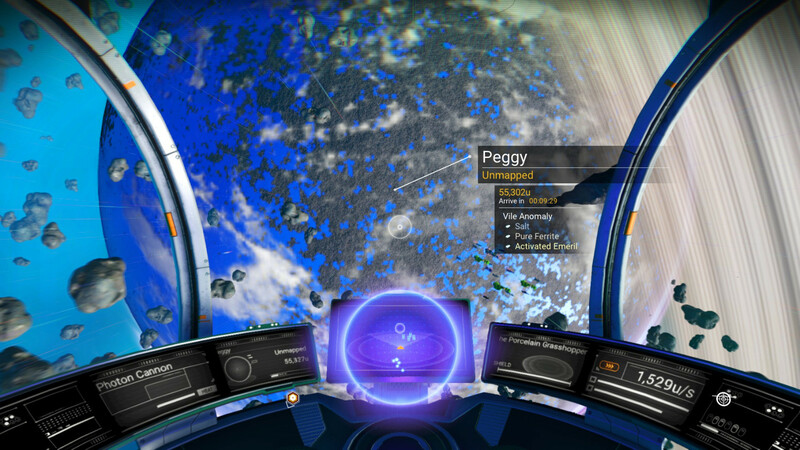 It&apos;s within striking distance (50k LY) of the Pilgrim Star, a historical site I&apos;ve been thinking about lately, and I wanted a way station in this general part of the galaxy. But the large oceans made it a great place to play through the Abyss storyline. 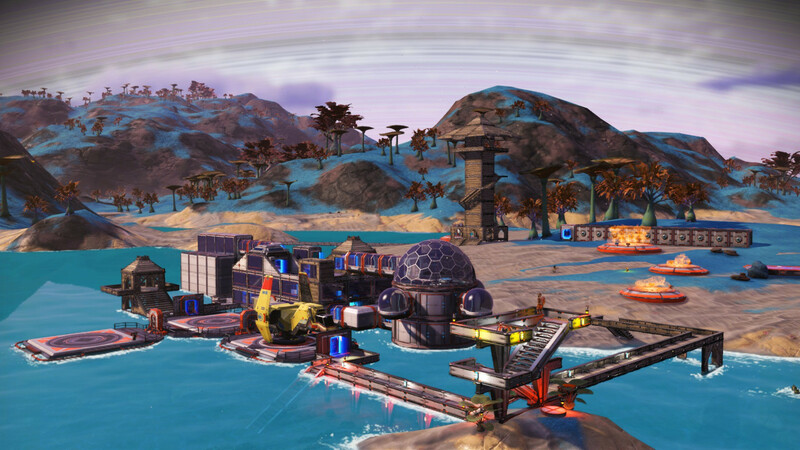 The server glitch that was preventing me from seeing player-built bases on New Lennon, the Galactic Hub&apos;s capital world, finally righted itself so I toured some bases tonight. 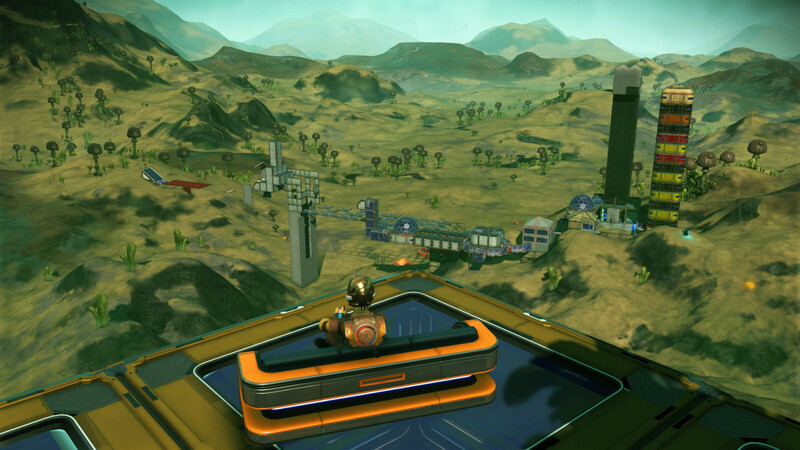 It&apos;s actually less densely populated than the portal world, Gain&apos;s Folly, but bases are more evenly distributed across the planet. 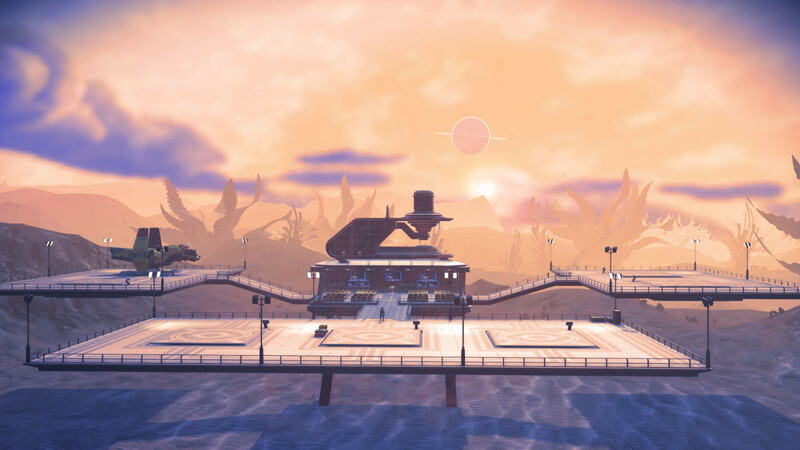 New Lennon&apos;s portal sits right on a lake, with some lovely views. 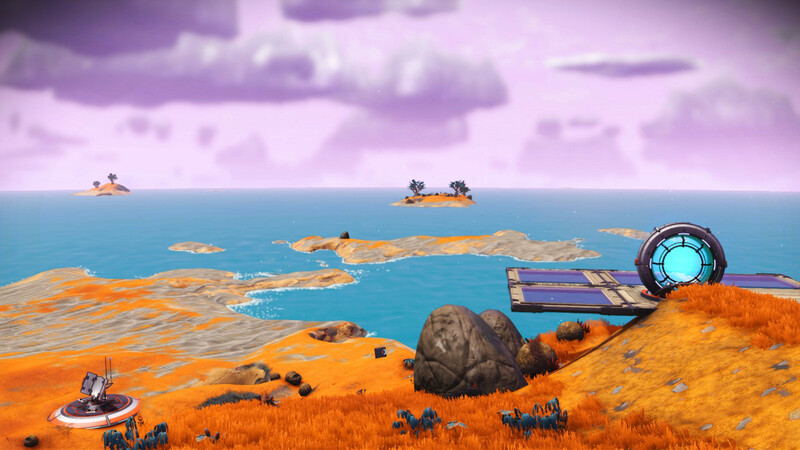 I wonder if I should build something here. It got some news writeups and he streamed the last hour of the journey. 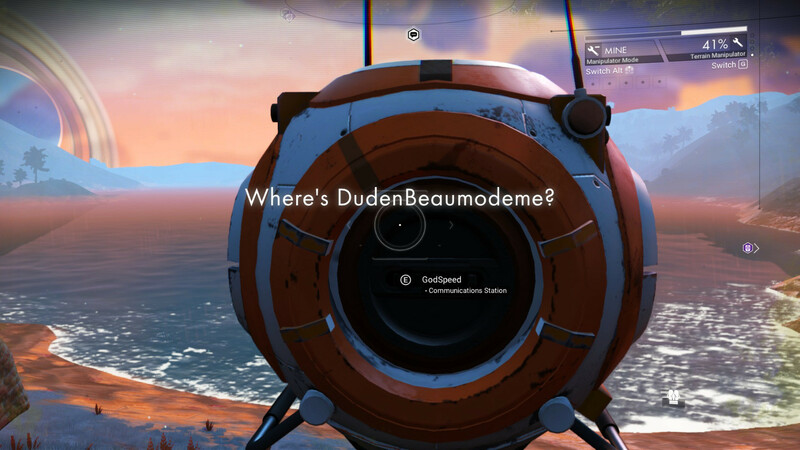 The planet Dudenbeaumodeme has regenerated multiple times since then. 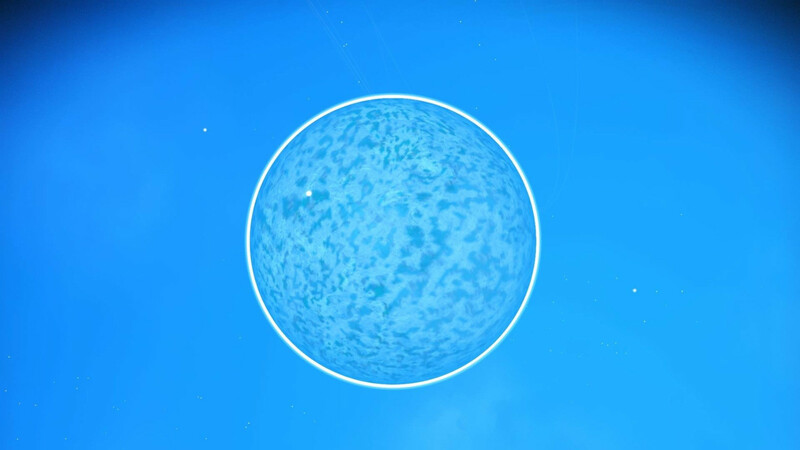 But there is still a planet there, and I get to wondering what it&apos;s like these days. 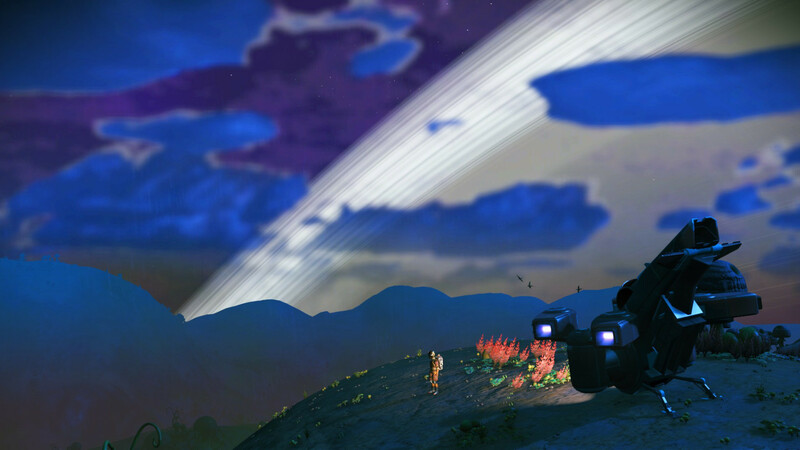 The journey to the Pilgrim Star goes quickly, and I soon have an answer as to what the historic planet is like these days: a world of blue grasslands and near constant rain, kinda miserable but pretty in a way. 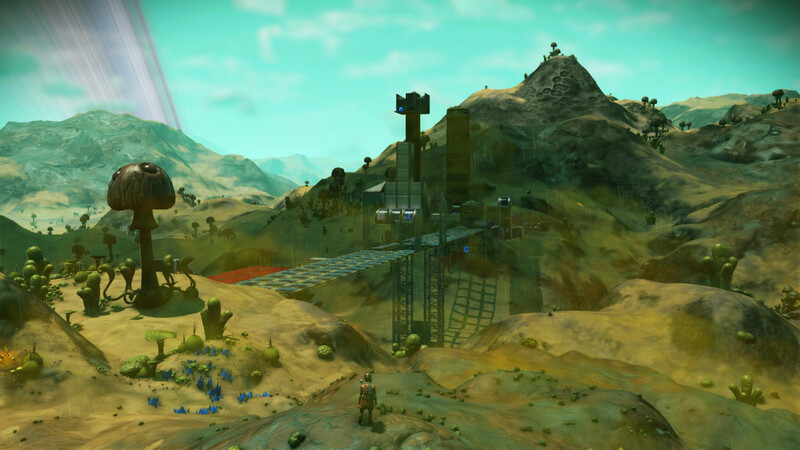 No bases here but a few player messages wondering what&apos;s become of the planet, and a few others buried inaccessibly deep beneath the long since regenerated terrain, probably marking some now-vanished base. 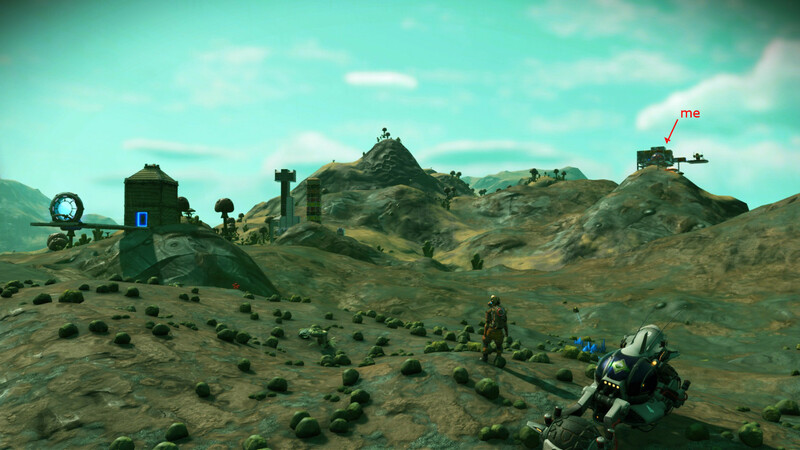 There are "uncharted" systems, which have zero settlement of any kind. 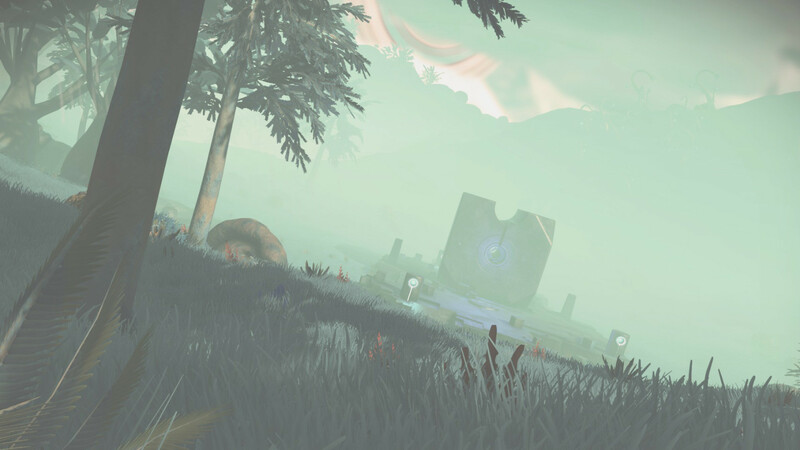 Exploring these feels like being in nature, quiet and mostly pleasant. 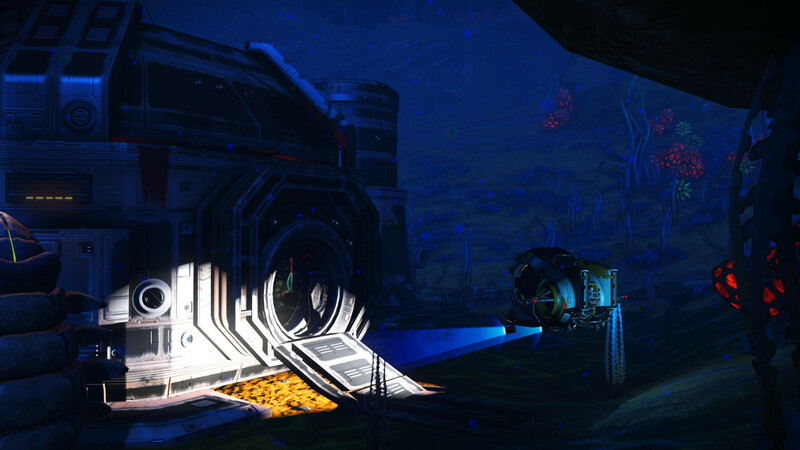 Then there are "abandoned" systems, which have most signs of sentient habitation, but... nobody&apos;s around. The quiet here quickly becomes creepy. 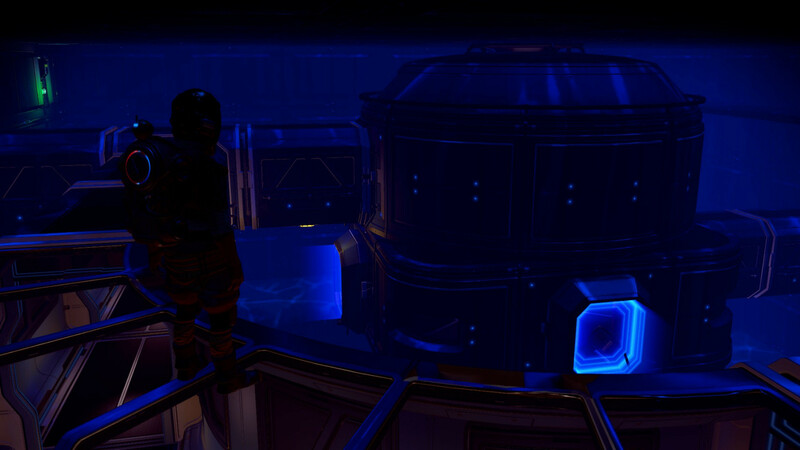 Trade platforms are usually full of activity, but this abandoned one feels like the Korvax left in a hurry. Like driving through a ghost town, stopping to get out and look around for a bit. 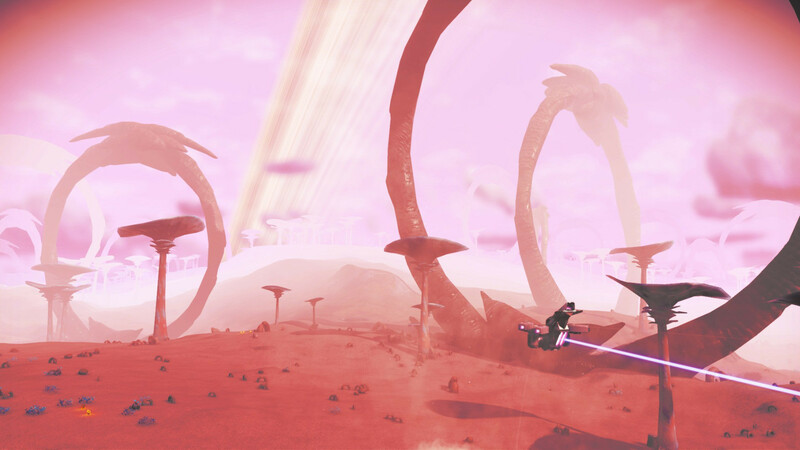 Week 2 of unbreathable air here in the Bay Area, and the extreme planets of No Man&apos;s Sky are a strangely pleasant escape. 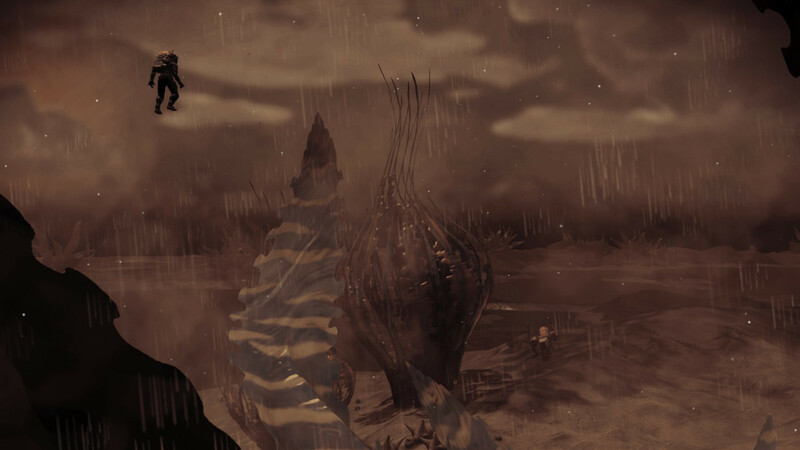 The atmosphere of a world with giant, writhing plants rendered absolutely everything sepia - no filter! 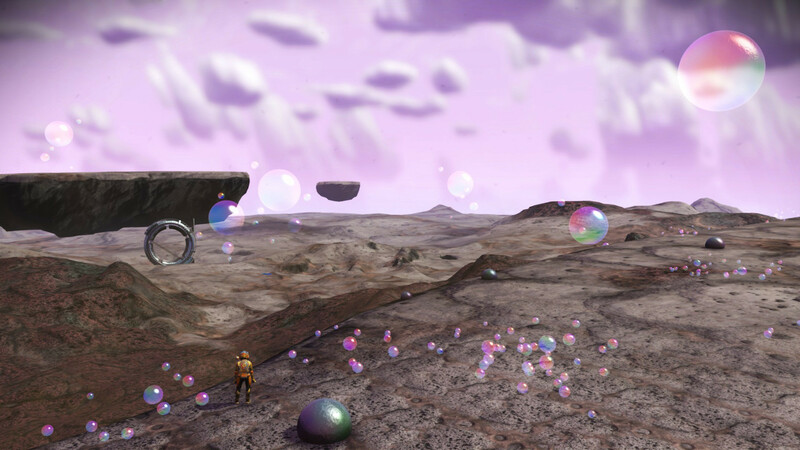 Another was a desert of colorful bubbles, with a terminal that rambled vague and unnerving about time travel... I feel like I&apos;ve been seeing that more and more lately. 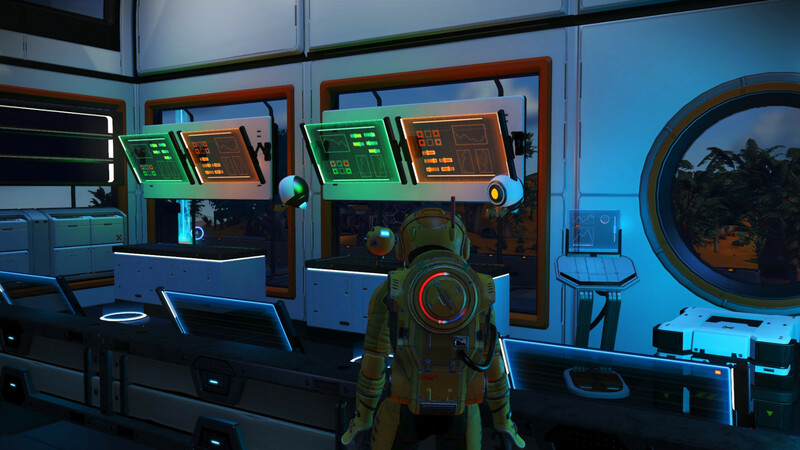 Maybe HG has something planned for the final weekly event? Finally made it to the Galaxy Donuts location at Wicomico Beach, #16 in a franchise of player-built fast food restaurants. The robots who took my order were very polite. @jplebreton i remember there being land disputes in a co-op minecraft server I was on some 8 or so years ago, but it was kind of the same dynamic, I remember building something on top of a hill too. 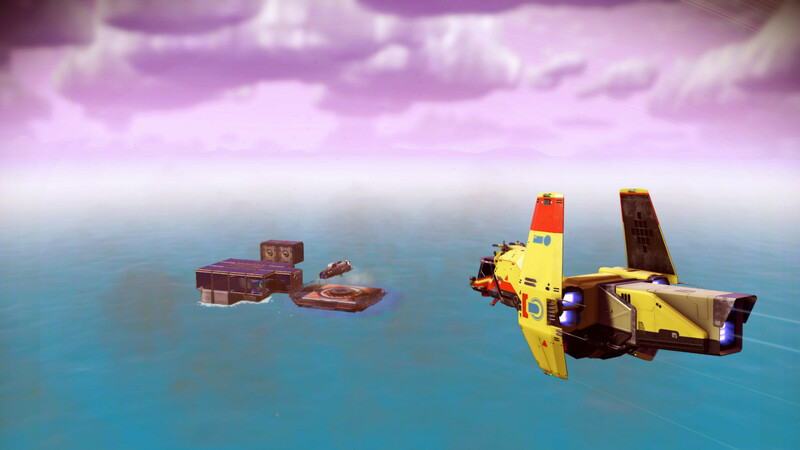 @jplebreton The third one looks like something Chris Foss would paint, with the brightly coloured ship heading for it. @jplebreton this is pretty much my wife&apos;s approach to Minecraft - she was most impressed with the work of César Manrique when we visited Lanzarote who believed in the principle that buildings should meld with nature, not fight it. @ElectronDance ahh fantastic, hadn&apos;t heard of him. thanks! @jplebreton I&apos;m so enjoying these! 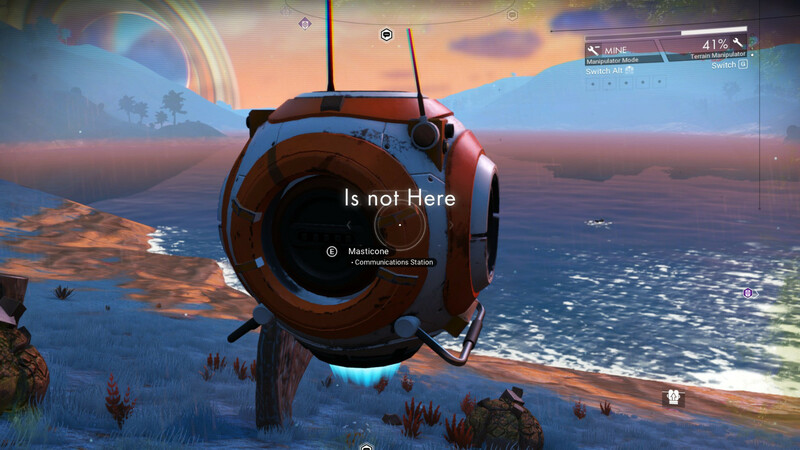 I don&apos;t recognise the game though, is it No Man&apos;s Sky?